At Laurea, we use the Lipomatic vibration liposuction procedure. 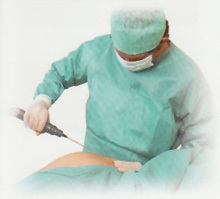 Our device allows for the operation to be carried out in a less traumatic way than with traditional liposuction. The procedure allows the easier removal of the adipose tissue while not affecting the other tissues ( as muscle, vessels and nerves ). That is why the post-operative recovery is fast and short. The frequency of vibration used is the same as the frequency used in the anti-pain TENS devices.